When learning anything, you must have motivation. Otherwise, it’ll get boring pretty fast. Thankfully, we have YouTube to help us get inspired! Early on in my Japanese language-learning career, access to the Internet was limited thanks to our dial-up modem. Performance was less than stellar due to painfully slow speeds. It took 3-4 hours to load a 3-minute video, and gigantic downloads like 1 GB took the entire night to slowly write onto my Windows ME hard drive. It was hard to stay motivated because I had little encouragement and no idea what my dreams might look like. With the blessing of high-speed internet (and a new computer), however, a whole world opened up to me, and YouTube became a large part of it. Thanks to the inspiration of multiple Youtubers, I was finally able to give shape to my dreams of learning Japanese and living in Japan, and set goals to get there. So today, I want to share with you ten of my favorite Japan-related YouTube channels that get me excited about Japan, and hopefully you’ll get excited too! Micaela was the first J-vlogger I ever watched or subscribed to. She inspired me because at the time, she was very introverted and not all that comfortable vlogging (like me), yet was in Japan, attending music school, and through the camera, telling shy little me that my dream was possible too, that I didn’t have to be perfect either, that it was okay. It was thanks to her that I started trying again, even though I would stumble over myself many times after that (and still do), and her older videos are special to me because of that. Her channel has gone through several changes in terms of content. For a time, it was highly travel-oriented thanks to her former contract with Nestle, and then it was dormant. Lately, she’s been relaxing more, uploading casual vlogs as well as travel videos that I quite enjoy. Formerly a channel known as GREEN ROOM (which showed behind-the-scenes footage from various Hello!Project and UP-FRONT groups), Girls Night Out is a weekly web show based on a theme of girls hanging out together. One thing I like about it is that it showcases various parts of Japan. In one segment, the girls get to go outside of the studio and visit shrines, local attractions, shops, and cafes, and experience both peaceful and exciting things. Other segments of the show include cooking, DIY projects, fashion consulting, and taste-testing of healthy foods or unique items offered at an online mall. Note: This channel is entirely in Japanese. Related Channels: Hello!Project Station, Upcoming, PINK CRES. I’ve only been subscribed for a short time, but Angela’s videos are incredibly inspiring to watch. She loves sharing the lesser-known attractions of Japan, steering you away from the tourist traps and into quaint side streets and districts only visited by locals. Part of the WAO-RYU TV network of channels, DoKiDoKi Drawing teaches you manga drawing techniques, tips for coming up with stories, Japanese animation techniques, and more. A good number of their videos are in Japanese with English subtitles, so keep the subtitles off and you’ll get some good listening practice! Related Channels: Kawaii Pateen, Only in Japan, etc. Grace and Ryosuke are different from most J-vloggers I watch. They enjoy the outdoors, the countryside, simple living, and weird things. Grace has a blog and draws comics about her life in Japan, and her YouTube channel supplements those two things with helpful tips, comparisons (Japan vs. United States), travel videos, and daily vlogs. She and her husband are very real in their videos, which I always appreciate. It was refreshing to see the different vibe they bring to the J-vlogging community. What they share is simple and straightforward, and their perspective is unique. Especially because Grace is a fellow artist, this helped give me an idea of how I might be able to live–the work, the lazy days, the travel–day-to-day in Japan. In fact, these two have inspired me so much that I put money down and supported them on Patreon until the start of their one-year social media hiatus. As of this writing, they’re in the middle of their hiatus, but go ahead and follow them so you’ll get updates when they come back! Life Where I’m From is a great channel that does an amazing job of taking complex (and, in come cases, touchy) topics and breaking them down to their basic, unbiased parts, such that even kids can enjoy watching and learn a lot. LWIF has some of the highest-quality videos about Japan that I have seen, not just from the picture/sound aspect, but also from the informational aspect. Collaboration from around the world is highly encouraged, so kids can see what life is like for other kids in other countries. Go! Go! Nihon is a completely free service that helps you select and apply to Japanese language schools, find and book accommodation, and supports you while you’re in Japan. I’ve known about Go! Go! Nihon for a few years, but only recently came upon their YouTube channel. They have begun to use it in a brilliant way by sharing not only what the schools look like, but also how to get to each school, what various accommodation options look like, what their study trips consist of, and a lot more. They hold live shows every week on Facebook and answer viewer questions, and then post those videos on YouTube. Frankly, this is my favorite series because they really do try to answer as many questions as they can. I seriously appreciate how much they want to help you. Sharla’s channel remains one of my favorites because of the quality of her content. She shares so many experiences that I would have never thought to try, and is very open, straightforward, and easygoing as she does so. It doesn’t take watching many of her videos before you start to feel like she’s a friend who’s just sharing her tips and life with you. At the same time, the professional quality is not lost, which is unique. I found Martina’s channel through a related video last September, and I’ve been subscribed ever since! Her channel has grown from less than 600 to more than 1000 subscribers in that time, and I expect that number to keep growing. Why? Because Martina’s channel is unlike any other “J-vlogger” channel I have followed. She recently graduated from an art school in Japan, specializing in 3D modeling and character design, and has worked all sorts of jobs, ranging from teaching English and Italian to fashion designing to manga-ka assistant. She brings her unique Italian artist perspective to the J-vlogging community, positioning her channel in a crucial spot that is normally left vacant by other YouTubers: the day-to-day reality of living in Japan as a foreign student and employee. 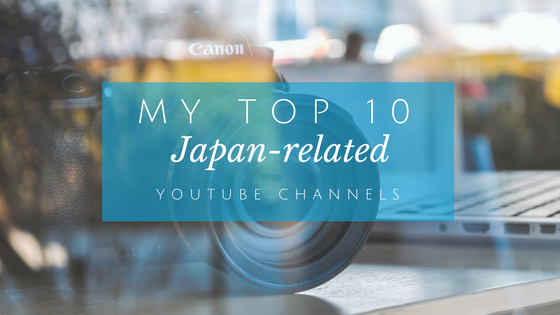 Martina’s channel is a wealth of information, much more than just the highlights of living and working in Japan. Her experiences, both good and bad, help to give viewers much more realistic ideas of what their day-to-day life in Japan might consist of, regardless of their profession or school. Her vlogs are so refreshingly real and imperfect in the best of ways. What’s more, she is constantly sharing info about Japan that is either new to me or explained in more depth than I have seen elsewhere. Want to know more YouTube channels I recommend? Check out my updated Resources page! What are some of your favorite J-vloggers or Japan-related YouTube channels? Let me know in the comments below!